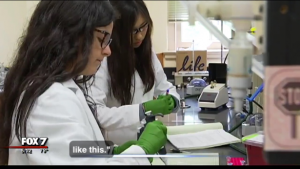 The DIY Diagnostics Stream is part of the Freshman Research Initiative, a program that teaches students science through independent research experiences, in the College of Natural Sciences at the University of Texas at Austin. We are part of the do-it-yourself (DIY) health diagnostics revolution, developing diagnostic tests to improve patient and environmental health. We do not adhere to any particular technology platforms and attempt to create diagnostics using any combination of the following; molecular biology, chemistry, electronics, and computer programming. Educationally, the DIY diagnostic stream emphasizes the iterative nature of prototype development along with the power of teamwork to solve difficult problems. DIY believes that all students join the stream with unique backgrounds and skill sets that are assets to the research team. DIY nurtures these individual skill sets both to build student confidence and to foster a more creative environment.